During an expedition to Norway we were diving on several shipwrecks along the coastline of Norway in the south and far above the polar circle. Most exciting wrecks are from the World War II battles. After some nice drinks in the local pub, following our weekly training sessions in the pool, Paul, Marc and myself we decided to go that summer together to Norway for a diving expedition, especially on the World War II shipwrecks. This should definitely be getting a real adventure. Arrived in Kristiansand, we decided to do immediately a first dive on the popular and very impressive German cargo shipwreck, the "M/S Seattle", sunken in 1940 after being ablaze for 3 days before hitting the rocks. All crewmembers were able to escape during the disaster from the ship. The vessel lies at a depth of 23-70m and has a length of 145m. A dive shop in Kristiansand arranged the trip to the wreck. The dive was very interesting with plenty to look at, but would need much more descends to explore it in details, especially the bridge. Unfortunately, Marc lost his 20mm underwater lens of his camera at the stern, near the propeller at more than 40m depth. Three weeks after, by doing our last dive again on this wreck before driving back home, we made the mission impossible real and found the lens back on the ground near the wreck at 42m depth and fully functional. The most exciting places for diving in Norway are definitely the Lofoten Islands 100-250km above the polar circle. The Islands cover an area of about 1200km2 and nature being of the most spectacular appearance. In addition to wonderful nature dives, a lot of shipwrecks are in the immediate area and rather easy to dive. So, Magne Goffeng from the "Lofotdyk Dive Centre" took us first to the wreck of a steamship called "Ramø", sunken in 1946. The length is about 100m but the wreck is rather destroyed. The highlights are the huge steam boiler and the big propeller behind the rudder. The harbour of Svolvaer, main town on the Lofoten Islands has a great surprise to offer to wreck divers. A huge German cargo vessel lies 90° at the starboard side on the ground in 25m depth. 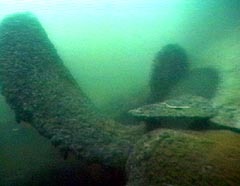 This highlight is accessible in all weather conditions due to the position inside the harbour of the wreck. 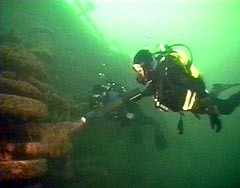 The "Lofotdyk Dive Centre" offers even night dives on this wreck, which are unique in sensation and experience but require very strong briefings and orientation sense as in the dark it is sometimes not possible to distinguish the outside from the inside of the wreck. Powerful lamps are a must. Impressive in every details are the anchor capstan and the oversized chain while diving along the deck. The wreck is much more destroyed at the back but passing into the very huge cargo spaces inside with a powerful lamp is quite impressive and gives some ideas about the size of this sunken vessel. Back on the main land on the Norwegian coast we visited Bodø for another wreck highlight we heard about. In the Dive Centre in town we arrange a trip to this spectacular wreck "M/S Rabat", together with the 4 Finnish divers we met and dived together the days before on the Islands. This wreck dive turned out to be one of the best we ever did in the past. The German vessel has been build in 1929, has a length of 86m and lies perfectly upright on deep 40m ground in the harbour of Bodø. The ship was sink by an English aircraft bomb the 4 October 1943. The whole wreck is worth a visit especially diving along the deck among plenty of fishes crossing in front of you. Diving under deck and inside the cabins is exciting but you should always have an eye on your bottom time, as the dive is quite deep and decompression stops obligatory. 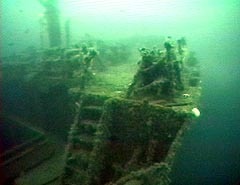 Foreseen several dives for exploring this wreck in details. Although the calm situation of the harbour area, diving on this wreck should only be done by experienced divers with decompression practice. Wreck diving is one of the most exciting, thrilling and spectacular experiences in scuba diving and most of these wrecks along the Norwegian coast are somewhat more interesting due to their involvement in the World War II battles. Due to some difficulties by either the depth the visibility or the size of the wreck, some strong previous experience is required. I also recommend strongly to use and take your own diving equipment with you, especially drysuits, cold water regulators and powerful lamps on such an expedition. If you are looking for a real adventure and good wreck diving, Norway is definitely worth more than a recommendation.